Meryl Streep's acceptance speech after receiving a lifetime achievement award at the Golden Globes turned out to be the opening volley in a war of words with President-elect Donald Trump—but a pair of Chicago pundits recently defended the actresses stance. “I’m sorry the president elect felt he needed to engage—and by the way, I think she is a very fine actress,” said David Axelrod, former chief strategist for President Barack Obama. “Her saying it on that platform may not have been a big deal to some people, but saying it now in this moment of such hatred and violence and discord—it matters,” Rikeesha Phelon, a prominent Illinois communications professional, told NBC 5. The comments came Monday at a City Club address preceding Tuesday’s farewell speech from Obama in Chicago. The actress never mentioned Trump by name in her speech, but it was clear who her target was in pointedly saying that a performance from the past year that stunned her came from the campaign trail. She noted an incident where "the person asking to sit in the most respected seat in our country" imitated a disabled reporter from The New York Times. Streep said "when the powerful use their position to bully others, we all lose." 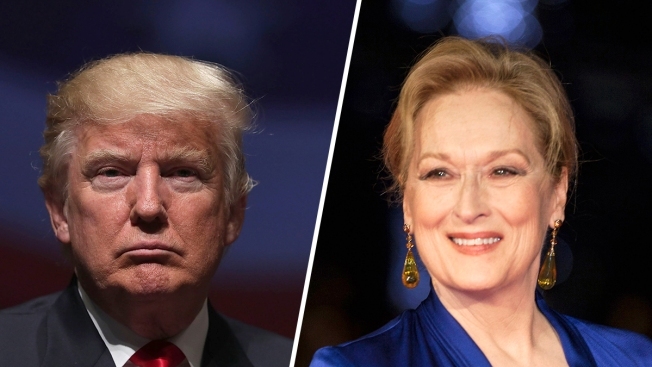 Trump responded in a series of early morning tweets, calling Streep "one of the most over-rated actresses in Hollywood" and "a Hillary flunky who lost big." He also defended himself against claims that he was mocking Times reporter Serge Kovaleski. Streep's comments on Trump also drew a backlash among conservatives on social media, including Senator John McCain's daughter, Meghan McCain, a Fox News host who has been critical of Trump.